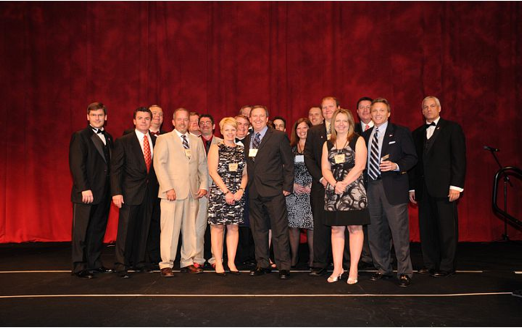 The Central Ohio franchise group for Papa John’s has been honored and awarded the company’s prestigious title of Franchisee of the Year for 2010 at the Papa John’s worldwide Operators Convention in Orlando, Florida. on March 8. Johncol, Inc. is based in Columbus with 22 franchise restaurants headed up by Franchisee Allen Hertzman and Operating Partner Charles Burris. The Johncol team received the award from Papa John’s founder John Schnatter in recognition of their outstanding sales growth, Pizza Quality, Customer Service and excellence in store operations and restaurant image. Hertzman opened his first Papa John’s Restaurant on Bethel Road in 1991. Since then Johncol has expanded in the greater Columbus area including locations in Delaware, Marion, Mansfield and Newark/Heath.